Adam Gibney’s work, mostly realised in the form of installation, is a combination of sculpture, projection, sound and video. He feels it is important to immerse the viewer in a situation so they can identify more immediately with the subject. He works from his studio at Moxie Studios in Dublin. Adam’s work began rooted in photography and the manipulation of photography. Then with the use of projection, he said he started to gain more control over technology and began to work with electronics. A lot of his work questions technology and its control over perceptions such as meaning and definition. His first solo show, entitled ‘Limbo Excavated’ was in 2011. 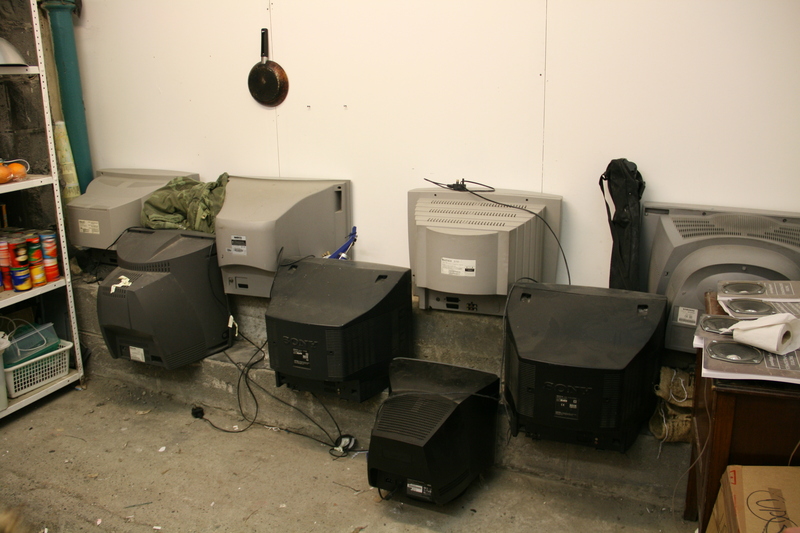 The work for this exhibition began with Adam questioning “What happens when technology fails?” His installations were manifestations of this idea. 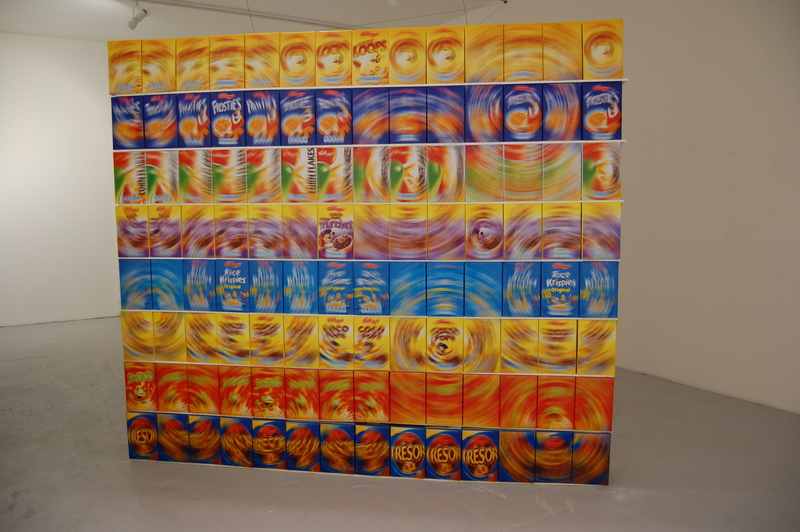 The concept for this exhibition emerged from the context of the supermarket. Adam was interested in the function of the packaging found in a supermarket. When a box is labelled and designed, the object in the box comes to rely heavily on this for its meaning, definition and value. Adam started to play around with what happens when you change the packaging and explored the impact this can have on the meaning of the object contained within. Although this work started by examining products of mass production and their reliance on advertising, Adam says that it has now moved toward more basic situations and varying ideas of fact and truth. He has been studying semiotics with relation to how meaning is constructed and how and why meaning can change. The philosopher Ludwig Wittgenstein (1889 – 1951) has been a strong influence on his recent work. Through this interest in Wittgenstein’s writing, Adam started to investigate what happens when language is pared down to its very essentials. His work Lesson no. 38: Idea, A Troublesome Little 3-Syllable Word, 2011, demonstrates how the pronunciation of a simple word can be broken down. A teacher explains to a cyber figure how to pronounce the word ‘idea’. She is not explaining the word, simply breaking it down into syllables. The more the word is said and broken down, the more the meaning can be considered at its most basic level. Adam is considering the notion of teaching language to a figure of artificial intelligence and how problems arising from this might be overcome. He felt that there was a certain intrigue created by bringing this piece into a gallery space because of the significance of the word ‘idea’ and the conceptual nature of the gallery space. In keeping with Adam’s inquiry into truth and fact, he told me about two works he exhibited that deal with this concept through language and colour representation. Class of 2011, 2011, is a work that consists of a group of televisions facing in to the centre of a circle. The viewer can walk into the circle and a robotic voice announces the colours that appear on each television screen. 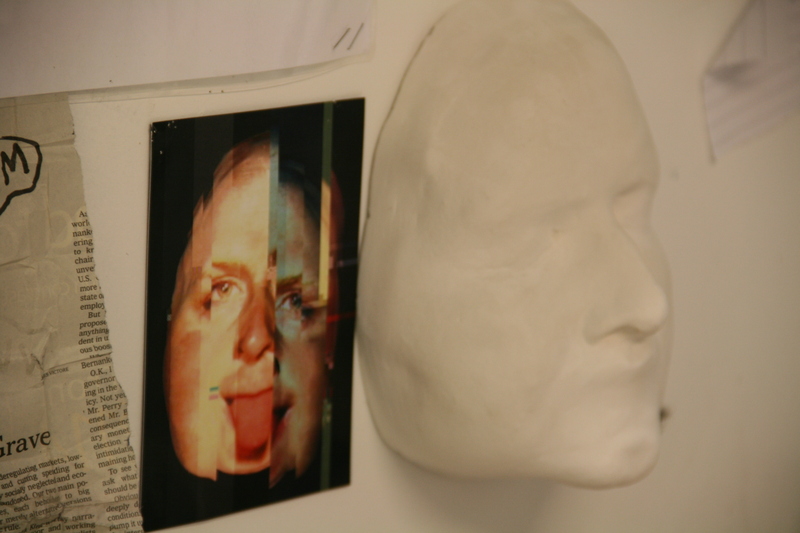 This piece was part of a larger body of work that was based on re-teaching technology. Adam says he was also interested in whether the colours are being determined by the words or the words are being determined by the colours. The other work that investigates truth and facts regarding colour is Matters of Fact, 2011. This work is an installation of a car that has different colours projected on to it. We hear two girls arguing about the colours they believed the car to be. The colours change with the statements the two voices make; or are the statements altered because of the changing colours? 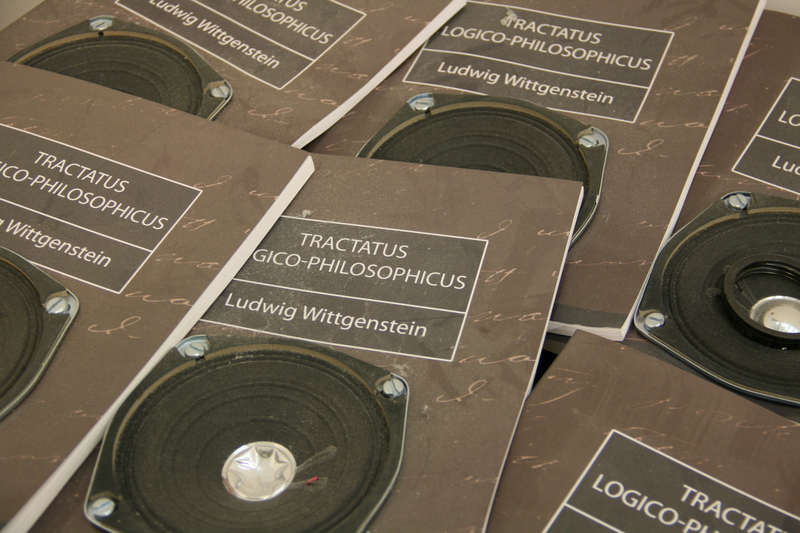 One of Wittgenstein’s books ‘Tractatus Logico-Philosophicus’, 1921, had a direct influence on one of Adam’s works, entitled Truth Serum, 2011. The book analyses the paring down of language to its very basics and goes so far as to compare language with mathematical equations. Adam’s installation of Truth Serum was a combination of food blenders and books of ‘Tractatus Logico-Philosophicus’. Each book had a section cut out of the middle that was replaced with a speaker. The work explored the physical act of bringing language back to its most basic level. The speakers produced quotes read from different sections of the book while pages from the book filled each blender and at certain times throughout the exhibition these pages were blended to a pulp, producing the most basic composition of the book. Adam has been invited on various kinds of residencies in the last couple of years and I asked him what he found to be the most beneficial aspects of them. He did a year long residency in the Irish Museum of Contemporary Art (IMOCA) in Dublin in 2011 and a month long residency in Chateau de Servieres, Marseille in France, also in 2011. 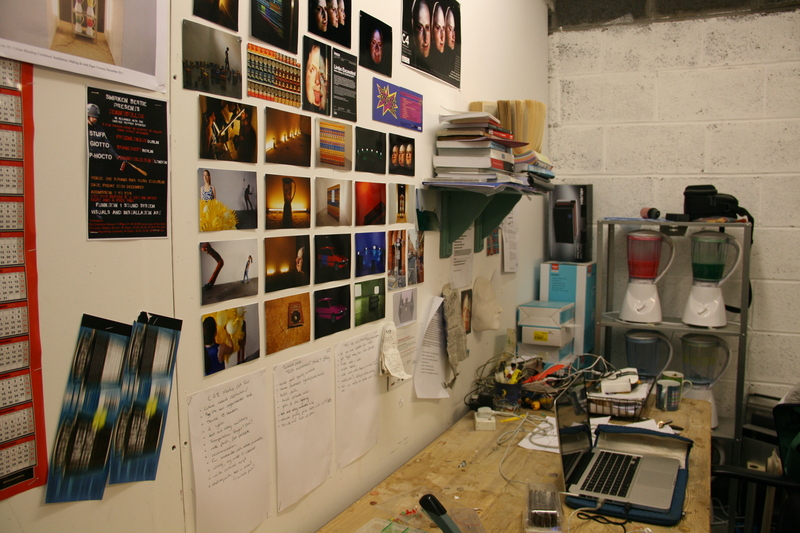 Adam said that because he had a full year to devote to the residency in IMOCA, he felt he had plenty of time to research, experiment with and really consider his ideas. He was able to try out large scale works in the galleries next to his studio and because of the fact that he had his first solo exhibition at the end of the residency he was able to work on a concept that encompassed all of his own work for the exhibition. Adam said that the residency in Marseilles was quite different to this in that he was commissioned to make work for an exhibition held at the end of the month long residency. He said that he spent the majority of his time there actually building the work and found because of the limited time it was not a residency where he could experiment with ideas. At the moment Adam is continuing to delve deeper into the examination of technology and definition and how they are connected. He is particularly interested in semiotics within science relating to technology and is currently investigating the combination of artificial intelligence and language. One of his most recent works in progress is a ‘still life’. Adam found the idea that there could be a ‘still life’ ridiculous when he began to study semiotics. He says that “when you look at something, it’s a sign and a signifier.” Using plastic bananas as the medium, Adam is trying to identify what is actually occurring within a still life through various connections. 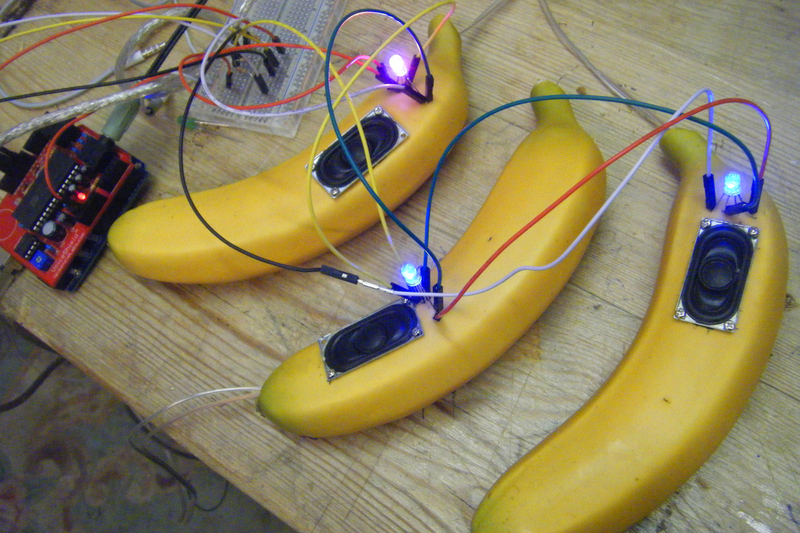 At the moment he is in the process of adding speakers to the bananas from which facts about bananas will be emitted. He may also add music, popular adverts and streams of consciousness. When he started this project he began with something else in mind but this is how it has evolved so far and he said it may still change as it develops further. Another project Adam has been working on is a collaboration between himself and Aoife McAtamney, a contemporary dance choreographer. The work they are doing, entitled AmoAmie, deals with human interaction and bond. It “explores why we relate. In doing so, it expresses the ever presence of bond.” Adam has been making sculptures and installations that react to this concept and the collaboration is evolving by way of Aoife’s contemporary dance reacting to these sculptures, installations and ideas.